It’s that time of year: The Hall of Fame Debates. And much like holidays spent with the family, it isn’t a lot of fun anymore, and alcohol helps. Alcohol always helps. Jeff Bagwell confounds you from the moment he settles in to hit with that spread-legged stance. This is not the intimidating bearing of a home run hitter. It is a game of Twister breaking out in the batter’s box. It gets worse. “I do everything wrong,” admits the Houston Astros’ first baseman. Uh oh. I don’t like the sound of that. He drops his hands with one of those classic high school hitches. He does not step in to the ball. He steps backward, with his front foot moving slightly toward his back foot, then plants the front foot. Kids, do not try this at home. Indeed, Bagwell once spoke at a baseball clinic and offered no more than the following bit of technical instruction: “Get a good pitch to hit and swing as hard as you can.” Shampoo bottles give more detailed instructions. Bagwell would make a perfect hitting coach. For the Toronto Blue Jays. 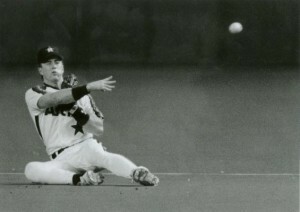 Bagwell’s career began in 1991, and ended in 2005. We could call that stretch of time my youth. All these years later, Bagwell’s stance is one that stands out. One that I vividly remember. Because it was different. Because it was unorthodox. Because it looked like it shouldn’t have worked. BagPipes, indeed. The more I read about Bagwell, circa 1999, the more I liked him. You know what else I liked? That the Boston-born Bagwell was traded by his hometown Red Sox in 1990 for 37-year-old middle reliever Larry Andersen, who pitched 22 innings of relief out of the Boston bullpen. I’m going to go out on a limb and say the Houston Astros got the better of that trade. Bagwell, then 22, was a 5’11”, 185-pound third baseman who had hit six home runs in 711 career minor league at bats. Six. Who knew? Not the Astros. Jeff Bagwell, no pop. Imagine that. By 1999, he was an All-Star, a MVP, a Silver Slugger, and a Gold Glover. He was the Houston Astros. Amid the mayhem Houston reached the  All-Star break percentage points behind the first-place Cincinnati Reds, mostly because of Bagwell. He had scored or driven in 28.6% of the Astros’ runs (chart, page 58). No other player in baseball had accounted for so much of his team’s offense. Bagwell ranked first in the league in walks (83), runs (81) and on-base percentage (.464); second in RBIs (78) and slugging percentage (.648); and tied for second in home runs (28). He could finish with 150 runs and 150 RBIs, a feat accomplished only once in the National League, by Chuck Klein of the 1930 Philadelphia Phillies. Eleven years ago, and nary a mention of OPS. The way baseball is evaluated, and written about, has surely changed. But regardless of which numbers were looked at, Bagwell was a star, one of the finest in his line of work. Bagwell’s combination of power and speed is unprecedented for a first baseman. He is on his way to his second 30-30 season. No other first baseman has had even one. His ability to hit for a high average to complement his power and speed is nearly as rare. Bagwell is a .305 lifetime hitter with 249 home runs and 145 stolen bases. Only two other active players have exceeded 240 home runs and 140 steals while maintaining a .300 average: Larry Walker and Ken Griffey Jr.
Reading the 1999 article, I was left more impressed by what Bagwell had accomplished. Bagwell also stands as a good representative of what has happened to baseball at the close of the century—it has become a game of powerball. Home runs never have been as easy to come by as they have this year; on average, one had been hit every 30.1 at bats as of the All-Star break. This is where it gets tricky. That summer, the summer of 1999, might have been the peak of the Steroid Era. In the entire 1980s, the 40-homer barrier was crashed 13 times. Last year 13 players hit 40. The demarcation point for the home run explosion is 1993, the first of the two most recent expansion seasons. In the six seasons since then—two of which were shortened by a strike—players have hit 40 or more homers 53 times. That’s four more 40-homer seasons than occurred in the previous quarter of a century (1967 to ’92). What happened? Take a look at Bagwell, your basic protein-packing, iron-pumping, creatine-chugging, andro-popping, body-armor-wearing ’90s kind of slugger, who is 25 pounds of muscle heavier than he was as a Red Sox prospect. How could Gorman have foreseen all that? Uh, move along. Nothing to see here. Years later, in 2010, one day before 2011 (Happy New Year! ), even with the knowledge we now have, those long-ball numbers are still shocking. And ironic. Because it was the home run, Mark McGwire and Sammy Sosa, Chasing Maris, that brought me back to baseball. Perhaps, like Jose Bautista in 2010, it was from tweaks in approach, and sage advice from the likes of Tony Gywnn, that allowed Bagwell to put it all together, and make sweet baseball music with his bat. When Bagwell became a member of the Astros out of spring training in 1991, Rudy Jaramillo, then the Houston hitting coach, told him he was capable of hitting 20 home runs. Responded Bagwell, “You’re kidding me, right?” He hit 15 and won the Rookie of the Year award. Bagwell annually improved upon his home run totals after that, to 18 in 1992, 20 in 1993—a season cut short when his left hand was broken in September by a pitch from the Phillies’ Ben Rivera—and then to 39 in only 110 games in his breakthrough season, 1994. The ’94 season was truncated in August by another broken left hand (he was hit by a pitch from the Padres’ Andy Benes) and, two days later, by the strike. Bagwell finished with a slugging percentage of .750 (only Babe Ruth, Lou Gehrig and Rogers Horns-by, all between 1920 and ’27, and Mark McGwire last year had higher percentages) and was named MVP. As noted, Bagwell’s case for Cooperstown is, of course, not without controversy. He added 20 pounds that winter through intense weightlifting and a high-protein, low-fat that (heavy on egg whites, tuna, turkey and steak). Bagwell hit 108 dingers over the next three seasons, including a career-high 43 in 1997. His off-season regimen now includes not only Johnson’s training but also creatine, the nutritional supplement, and the controversial testosterone-boosting androstenedione. “It may help your workout, but it doesn’t help you hit home runs,” he says. Androstenedione. Legal, at the time. And speaking of home runs, imagine if Bagwell’s timing had been a little different. In 661 career games at the Astrodome, Bagwell went yard 126 times. In 422 games at Minute Maid Park, he hit 108 home runs. Here’s to short porches in left field: Cheers. Sure. It’s as crazy as a self-made home run hitter who swings a stub of lumber while doing the limbo. Absolutely ridiculous. “Absolutely ridiculous.” That’s how Verducci, fittingly, ended his article. And if Bagwell is enshrined in Cooperstown, some will argue that’s what should be inscribed on his plaque. Bagwell never made it to 50 home runs, that fateful summer of 1999. He finished with 42. But if 2010 is any indication, Bagwell was certainly noticed. After going back in time and reading Verducci’s piece, Bagwell’s case is an admittedly all-the-more tough one for the jury. I eagerly anticipate the verdict. To read One Of A Kind by Tom Verducci in its entirety, please click here. And the image way up top is courtesy of The Houston Chronicle. Thanks, guys. We hoped you liked reading To The SIVault: Jeff Bagwell by Navin Vaswani! When there was the Mark McGwire lashing, Didn’t people go crazy on androstenedione, saying that no one would use it WITHOUT also using steroids? Verducci’s nonchalant attitude towards Bagwell’s andro use was the most surprising element of his article for me.